This is not meant to replace a user manual. These are my opinions and observations, and a general guide to how testers work. If you have a manual, read it and follow its instructions. Do not put a tube in the tester. Plug the tester in and turn it on. Let it warm up for a few minutes. Almost all tube testers use tubes themselves. Most machines have some way to adjust for variances in the line voltage. By using a consistant voltage, you get better apples-to-apples readings when you make tests. Line voltage adjusters vary depending on the machine. On most, you turn a switch to a position named something like LINE ADJUST, and then turn a knob; as you turn the knob, the meter needle will move. Somewhere on the meter face there should be a mark (usually says something like Line Adjust), and you turn the knob until the meter needle matches the mark. You only need to adjust the line voltage once per session, or unless you suspect that something may have significantly changed the line voltage (e.g. the central air conditioning cycled on). There's a debate about whether you should put a tube in as a load when setting the line adjust. If you have the owner's manual, see if it mentions this. Hickok says the line adjust should be done without a tube in any of the sockets, because the line adjust had been engineered to work without a load. If your tester does not mention this, I would assume the same thing (don't use a tube). There should be a book or a roll chart that tells how to set up the machine for a given tube. Find the tube you wish to test on the chart. Some machines have only one socket for tube base; for instance, there would only be one socket for octal tubes, one for loktals, one for 7-pin miniatures, one for 9-pin Novals, etc. Because any number of tubes with different pinouts can go into a single socket, you have to set the controls so that the pins are properly connected: heater pins, plate, cathode, grids, and so forth. It's very important to get this right because otherwise, you could put high voltage across elements that aren't meant to take it. You could blow the filament, which will ruin the tube outright; you could gas the tube, which won't kill it but may cause it to act erratically in use. It is also possible to damage the tester itself. This is why you have to set the controls first before you plug in the tube. Some machines have numerous sockets of the same type, which means you don't have to set a lot of switches, but does mean you have to find the right socket so the pins are configured correctly. Again—if you use the wrong socket, you could blow or damage the tube, or possibly damage the machine. Next, choose the filament (heater) voltage. Again, do this before you plug the tube in. It's a good idea to leave the filament voltage set on its lowest setting, and then turn it up to what's needed. If you plug in a 6 volt tube and the machine is set for 35 volts, you're going to blow the tube. If you accidentally plug a 35 volt tube in and the voltage is set for 6 volts, the tube filament won't be stressed. Once the socket is configured (or found) and the voltage set, you can plug in the tube. 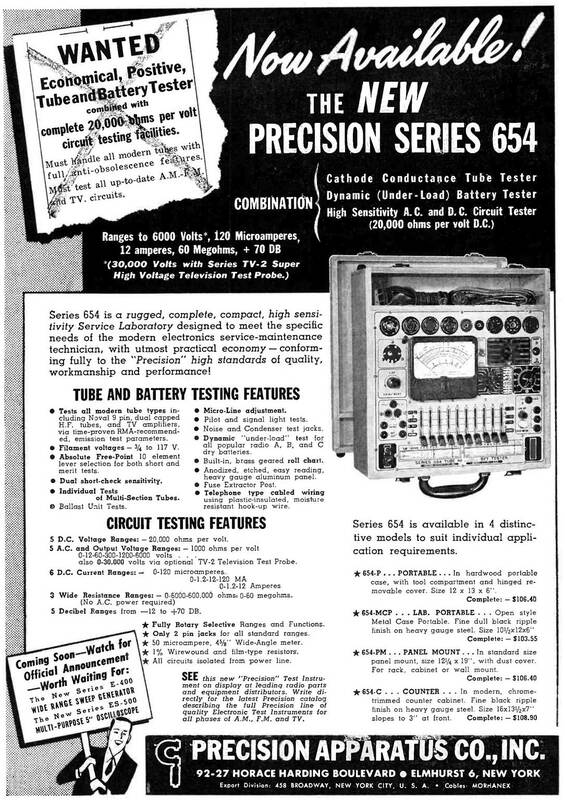 Tube tester instructions may recommend letting the tube warm up for 30 seconds or a minute. I prefer to let them warm more thoroughly unless I'm in a hurry. For emission tests, a fully warmed tube gives you a much more accurate result. I've tested tubes I thought were poor until I realized they were simply not warm, and they retested fine once they were. Voltage amplifier tubes (small current) don't need to be warmed much, but a beefy power tube or power-supply rectifier really ought to get nice and toasty if you want an accurate reading. Most testers I've seen, and any decent one, has a method to test shorts. The shorts tests should be done first. If the tube fails the shorts test, STOP. The shorts test briefly puts testing (high) voltage across different elements on the tube and looks for current. Ideally there should be no current, or too low a current to matter. Usually there's a lamp on the panel that will light as the shorts tests are being performed. A flash or flicker is okay—if the lamp stays lit, that means there's a possible short. A tube with an internal short can put voltages or currents in places where it was never designed to—either in your tester or the equipment where it's going to be used, and that can damage other components. If you suspect a tube of having an internal short, stop the test. That said, it is possible to get false-positives. My Sylvania 140 gives me a lot of false positives and I don't trust it. I thought my Hickok was bulletproof, but it doesn't like 6K7s; I now have a stockpile of 6K7s because I kept "replacing" bad ones until I found out they weren't shorted at all. If you suspect that you're getting false positives, or worse, false negatives—test them on another machine. Shorts tests are done differently depending on the machine you're using. My Hickok has a rotary switch and you simply run it around each position. My Sylvania and my EICO both have blade switches, and you flip certain ones to test for shorts. Other machines may have other methods. Whatever it is, you want to do this correctly. A merit test is the main test: plate current. After you do the shorts test, you can finish the non-critical settings for testing your tube. Usually that includes turning a knob so that the needle points on the "Good—Replace" properly. Tubes that are designed with very low plate current have to be set differently than a tube designed with high plate current, otherwise a voltage amplifier would naturally test weak and a power rectifier would test strong, but only relative to each other. The chart may tell you a specific scale or mark to use instead of the regular "Good—Replace" scale. My Hickok, for example, has a separate mark for diodes. It has micromho scales for transconductance, and the "english" adjust dial tells me which scale to use. All machines are different: for all but the simplest testers, you need the user's manual to know how to read the meter properly. Some machines test for Gas - typically it's a grid leak test. The machine's user manual will explain the procedure. Microphonics occur in audio amplifier tubes where physical vibrations inside the tube are picked up and mixed into the output signal. Again, it depends on the machine, but some testers have a socket where the old style high-impedance headphones (or an earphone) can be plugged in; you listen to the earphone/headphone and tap the tube lightly. For more information on tube testers in general and manufacturers and models in particular, see Alan Douglas's book, Tube Testers and Classic Electronic Test Gear. For more information on tube testers in general, I recommend Getting the Most Out of Vacuum Tubes by Robert B. Tomer.